An Amazon customer was stunned when she ordered a 3ft tall dog guard only for it to be delivered in a giant box complete with 30 FEET of brown paper to 'protect' it. 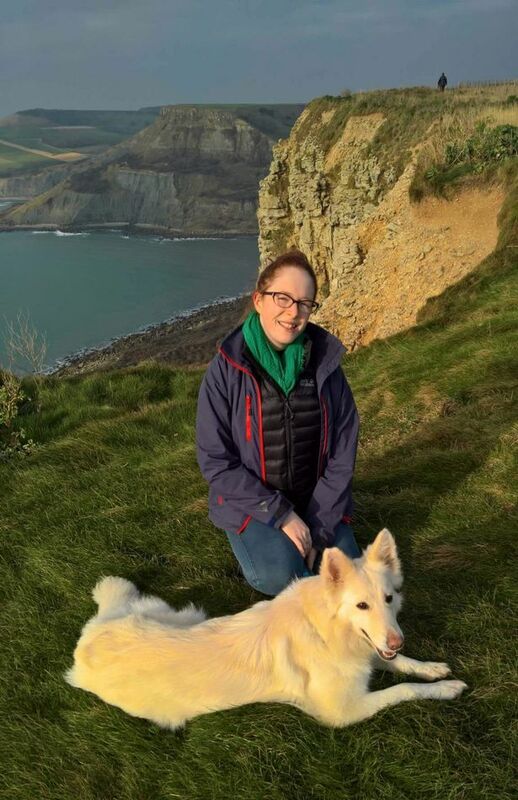 Deanna Walker ordered the £24.99 car guard from Amazon to prevent her four-year-old German Shepherd Snowey from leaping over the headrests and getting onto the car seats while travelling. But the country park worker, whose role focuses on reducing waste, says she couldn't believe it when she opened the 'giant' 18-inch x 3ft box and reams of brown paper came out 'like a magician's handkerchief trick'. Deanna from Parkstone, Dorset, said: "I got a message from my mum and dad saying a huge box had arrived and asked me what it was, I had no idea. 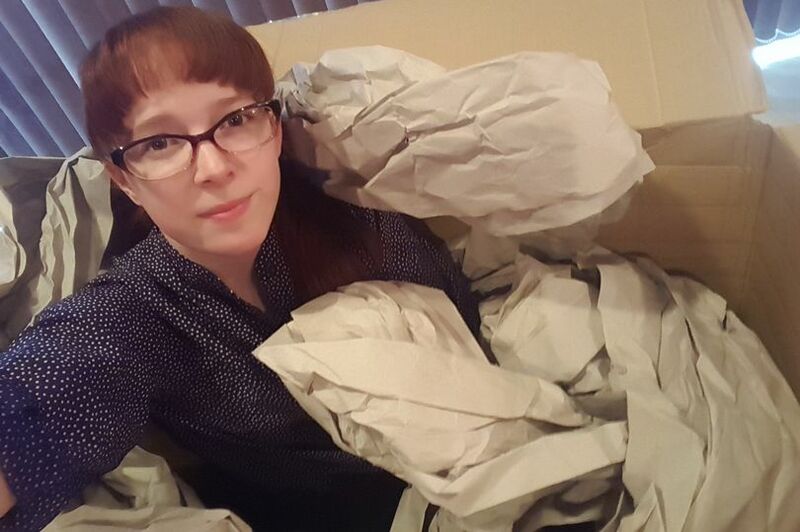 "When I opened it I had to get through a good few feet of paper before I realised what it was. "I was so angry. It's a heavy duty dog gate made of metal, there is a zero requirement for any packaging it's not like it's fragile and may break, it just needed to be in a box. "There's 30ft of brown paper there in total - it was coming out of the box a bit like a magician when you see them pulling a hanky out of their sleeve." 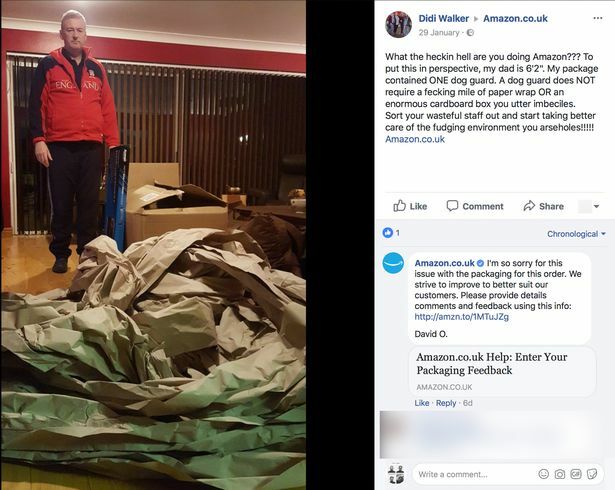 Deanna, 22, was so taken aback by the 'wasteful' packaging on the item, which is just two inches wide and 3 ft feet tall, that she vented online posing her 6ft 2 dad Gary Walker, 51, next to the box and paper to give an idea how much wrapping was sent. Deanna's post read: "What the heckin hell are you doing Amazon? "To put this in perspective my dad is 6'2". "My package contained ONE dog guard. A dog guard does NOT require a fecking mile of paper wrap OR an enormous cardboard box you utter imbeciles. "Sort your wasteful staff out and start taking better care of the fudging environment you a***holes!" 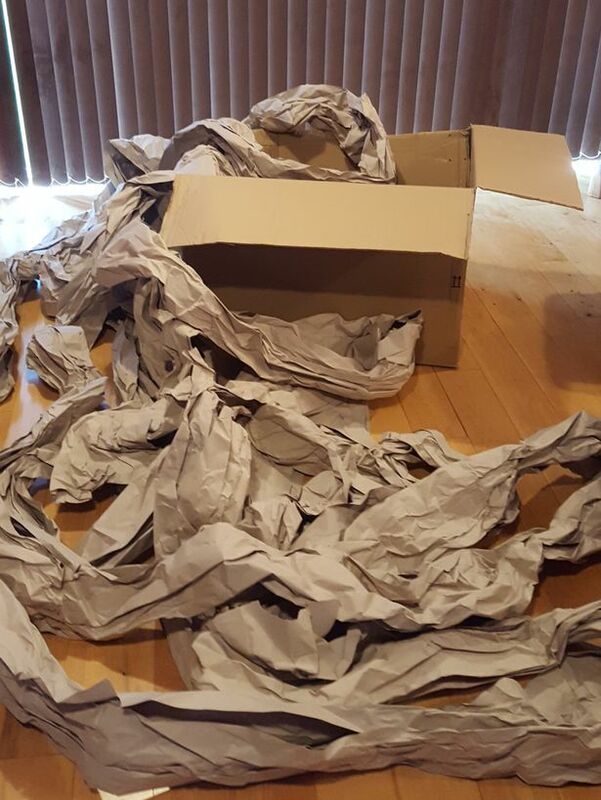 The country park public engagement assistant said: "I was angry to see so much paper and it's not the first time I've received a parcel from Amazon with too much packaging. "When I've been in touch with them they just fob us off with report forms, we don't see anything happen. "I got in touch on two types of social media - both times I was told to fill in a form which is a real disappointment, at the least you would expect an apology. "Amazon is such a huge company and are wasting so many trees. "My 6ft 2 in dad is in the picture as I figured he would be a good reference. "What are Amazon thinking? I don't understanding why they don't have some incentive to reduce the packaging or give back to the environment in some way, such as planting trees." An Amazon spokesman said: "We want to optimise the overall customer packaging experience. "This includes driving improvements in the sustainability of packaging across Amazon's supply chain, starting with our own packaging and our own operations. "About 25 million times a year, customers write to tell us they love how their products have been packaged. "They also tell us when our packaging hasn't worked - when their products were damaged, when the box used was too big, or just too hard to open. "This informs our worldwide packaging team and allows us and our vendors to make improvements. "If it's serious enough, their feedback can automatically pull what we call "the Andon cord" to prevent a product from disappointing another customer."